Why Is Elizabeth Warren Anti-TPP But Pro-Ex-Im? Who are the late-arriving Hillary Clinton challengers? We ranked them. Elizabeth Warren was leading contender early on for the 2016 Democratic nomination, based in large part on her strident anti-corporate rhetoric and progressive views. Even after several months of stating she did not intend to run, she continued to receive significant attention from the press and progressive activists, although more recently there has been little discussion of a possible Warren run in 2016. After a long career in academia, Warren became a favorite of progressive activists through her championing of a new federal agency intended to help protect consumers from lenders. After being passed over to head the new agency, she returned to Massachusetts, where she had previously taught law at Harvard, to run for the U.S. Senate. Warren has made her criticism of corporate America the centerpiece of her political career, routinely lambasting businesses she sees as engaging in conduct that damages American workers. Wall Street and the banking industry have been particular targets of her ire, and she claimed to have created the “intellectual foundation” for the Occupy Wall Street movement and said she supported its efforts. With only two years in office, Warren would bring one of the lightest resumes to the nomination contest in recent memory, although she has served just as long in the U.S. Senate as Barack Obama had before launching his candidacy in 2007. Her legislative achievements are scarce. The first bill she introduced, which would have required the federal government to lend to students at the same interest rate as the Federal Reserve lends to banks, was not taken seriously by most. She appeals to most major constituencies in the party, with the exception of the pro-business wing that will likely be turned off by her anti-corporate tone. While Warren seems unlikely to run at this late date, it should not be ruled out entirely. The situation most likely to draw her into the race would include a significant collapse in support and even the withdrawal of frontrunner Hillary Clinton, or a similarly major collapse for her current progressive challenger, Vermont Sen. Bernie Sanders. Absent either (or both) of these two possibilities, there is very little chance Warren will run in 2016. Elizabeth Warren (née Herring) was born on June 22, 1949, in Oklahoma City, the fourth child of parents Donald Jones Herring and Pauline Reed Herring. Warren grew up in what she would later describe as “on the ragged edge of the middle class.” Her father Donald, a janitor, suffered a heart attack when Warren was 12 years old. The ensuing medical bills and limited family income led to some financial hardship in the home, prompting Warren to begin working at age 13, waiting tables in her aunt’s Mexican restaurant. An exceptional student from an early age, Warren graduated from Northwest Classen High School in Oklahoma City at the age of 16. She was a champion debater, claiming the title of “Oklahoma’s top high-school debater” and winning a full debate scholarship to George Washington University. After two years of study at GWU, Warren left the university to marry her high school sweetheart, Jim Warren, an engineer and mathematician at NASA. The couple moved to Houston, where Warren completed her undergraduate degree in speech pathology and audiology at the University of Houston. Following graduation from UH, Warren taught special-needs student in the Houston area. Warren and her husband moved to New Jersey, where she continued to teach special-needs students. Warren enrolled at the Rutgers School of Law in Newark, N.J., and earned her Juris Doctor in 1976. She and Jim Warren divorced in 1978. Warren remarried in 1980 to Harvard Law professor Bruce Mann. Warren taught law at several universities, including the Rutgers School of Law–Newark from 1977–1978, the University of Houston Law Center from 1978 to 1983, and the University of Texas School of Law from 1981 to 1987, the University of Pennsylvania Law School in 1987 to 1992, and finally in 1992 she went to teach at Harvard Law School. 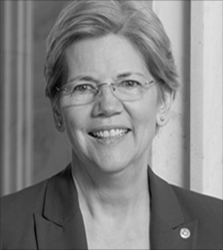 Warren was appointed by U.S. Senate Majority Leader Harry Reid (D-Nev.) to chair the five-member Congressional Oversight Panel created by the Emergency Economic Stabilization Act. During her tenure Warren and the panel released reports on foreclosure mitigation, consumer and small business lending, commercial real estate, AIG, bank stress tests, the impact of the Troubled Asset Relief Program (TARP) on the financial markets, government guarantees, the automotive industry, and other topics. She helped design the creation of such an institution as part of the 2010 Dodd-Frank Wall Street Reform and Consumer Protection Act. Following the passage and enactment of the law, Warren was appointed as Assistant to the President and Special Advisor to the Secretary of the Treasury on the Consumer Financial Protection Bureau, overseeing the setting up of the new agency. Warren announced her candidacy for the U.S. Senate in Massachusetts on Sept. 14, 2011, challenging incumbent Republican Sen. Scott Brown. Brown had won the Senate seat formerly held by long-serving Democrat Sen. Ted Kennedy in a special election in 2010, following Kennedy’s death. Warren defeated Scott Brown on November 6, 2012, taking 53.7 percent of the vote. In her career, Warren has had two major, controversial incidents that called her ethics and honesty into question. Warren has largely remained consistent to the progressive values and principles she espoused during her campaign and in her years as an academic. She has, however, advocated for the repeal of the medical device tax that was part of Obamacare, which is not surprising in light of the fact that Massachusetts has a significant medical device industry but does run contrary to her anti-corporate rhetoric.16 Warren announced her support for repealing the medical device tax during her campaign for the U.S. Senate in 2012. In her time in the Senate, Warren has also bucked the wishes of Democratic President Barack Obama and Senate Democrat leadership. Warren is generally regarded as an exceptional communicator. Warren’s only electoral victory came in a heavily Democratic state — Massachusetts — but it did come over a sitting incumbent Republican, Senator Scott Brown. Brown had previously shocked the political world by winning the 2010 special election to fill the vacancy left by the death of long-serving Democratic Sen. Ted Kennedy, defeating sitting Massachusetts Attorney General Martha Coakley. Warren has become a leader in the progressive movement as a result of her speaking prowess and commitment to hard-left values. In December 2014, more than 300 former Obama campaign staffers signed a letter urging her to run for president. Additionally, she was a co-sponsor of a bill that would require the Department of Health and Human Services to review any and all premium increases made by private insurance companies before they would be allowed.55 She also supports allowing Medicare to directly negotiate prices for the Part D prescription drug program,56 which many fear will lead to price controls on medicines. Warren’s vulnerabilities will likely revolve around her questionable scholarly practices, her discredited claims of Native American heritage, and her general support for corporate welfare despite making anti-corporate rhetoric a cornerstone of her career. The progressive base of the Democratic party is likely to ignore, dismiss, or forgive these transgressions, although they could become an issue in a general election if she became the nominee. More damaging to Warren will be the credibility hit she is likely to take if her support for corporate subsidies such as the Export-Import Bank becomes an issue. Warrant has based much of her career on strident anti-corporate rhetoric, and focus on this issue could cause many would-be supporters to look for a candidate more consistent on her supposedly core issue.